Electronic Transactions Association (ETA), the global trade association for the payments industry, is holding its annual event here in San Francisco this week. For many, the move from Las Vegas, the traditional location of the event, to S.F. represents a shift that emphasizes the growing role of technology, and in particular the impact of local FinTech startups such as Stripe and Square. 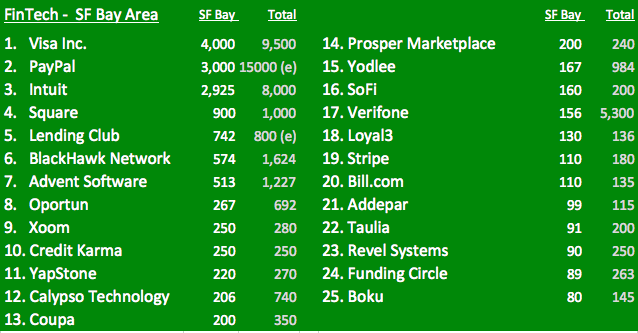 Below is a table of the Top 25 Companies in FinTech, ranked by employees in greater S.F. Bay area. Note how many are involved in payments (Visa, PayPal, Square, BlackHawk, Yapstone, Verifone, Stripe, Bill.com, Taulia, Revel & Boku). Although ~ 5,000 people are in S.F. for this event, a small fraction of Dreamforce (annual Salesforce customer event), the key changes underway in payments landscape from Apple Pay to Samsung Pay give this event outsized importance. 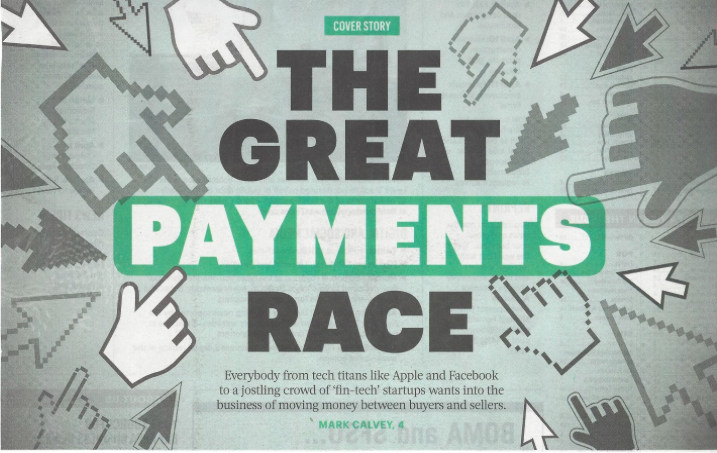 The San Francisco Business Journal even has a cover story on payments this week, reinforcing that fact, and calling out interesting startups like PayNearMe (a panelist at last week’s SF FinTech Meetup run by PlanWise‘s Vincent Turner). Although I’ve worked as a consultant with clients like MBNA (prior to its acquisition by Bank of America), launched co-branded cards and even worked on an ACH initiative, I am not a payments guru like Karen Webster of PYMNTS.com. But I follow FinTech and have a passion for innovation and the space, so will make a few observations. First, legacy payments companies – and by this I refer to the broadest set of banks, merchant acquirers, aggregators/gateways, and payment networks – are not standing still, and should be watched just as carefully as startups. Ben Horowitz, in talking about A16Z’s investment in TransferWise, said that “there’s not a lot of innovation coming from the banks.” Likewise, Foundation Capital predicted last week that banks will be disrupted by the new players in FinTech. I admire TransferWise and am a huge fan of Stripe, having had the opportunity to sit down with its COO, Billy Alvarado, and see its CTO, Greg Brock, speak at several FinTech events – but feel that A16Z and Foundation Capital may be overstating the case. The fact is that not all the value added is not coming solely from the startups. 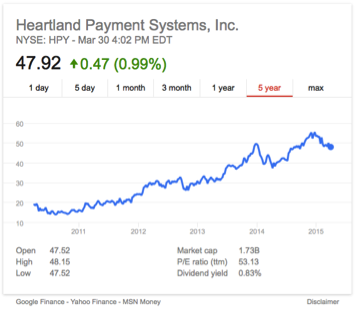 Just look at a less cool, big legacy player in payments: Heartland Payments Systems. I would look to startups for their ability to be super fast, be focused on great products and use the latest tech stack, but don’t forget about value created elsewhere, e.g. among big corporates. Beyond value, I’d also say innovation is not the sole domain of venture-backed startups. They are important, but I think the differences between venture funding and private equity are starting to narrow. In today’s Wall Street Journal, Andy Kessler argues “The Glory Days of Private Equity Are Over”. I disagree since companies like Betterment (see my recent interview with its co-founder) are receiving funding from both VC’s and private equity firms. Peter Christodoulo, a partner at Francisco Partners, sits on board of Betterment, Paylease and Paymetric. Or consider First Data. It went private in a deal led by KKR. While it may seem to be a cost-cutting driven deal, consider that in recent years it began sharing ownership with employee-partners (like a VC funded business). And in terms of innovation, First Data is expected to make major new announcement here at TRANSACT 15. (I don’t know its president, Guy Chiarello, but met him when I was hired into his organization at Morgan Stanley where he’s still widely admired an an innovator, not a cost-cutter). Likewise, Vantiv, one of the major sponsors of TRANSACT 15, went private several years ago in a deal with Boston-based Advent International, and continues to win awards and do well in terms of market share. So, I think it’s clear startups and corporate players, plus VC’s and private equity all can create value and innovation. I look forward to announcements here at TRANSACT 15 in San Francisco, and will be sharing details on Twitter. Posted on March 31, 2015 March 31, 2015 by Michael Halloran	This entry was posted in Uncategorized and tagged Bill.com, Boku, First Data, Heartland Payments, PayNearMe, PayPal, Revel, Square, Stripe, Taulia, Vantiv, Verifone, Visa, Yapstone. Bookmark the permalink.